My dear little baby is 6 weeks old now, can you believe it? Life with a fourth child hasn’t been quite as different, or difficult, as I had thought it might be. Sure, there are the normal things you’d experience with a baby – you have to drop everything you’re doing when the baby cries to comfort or feed him, you suffer through sleepless nights, sometimes you have to skip a meal and then forage through the pantry when the baby’s finally asleep, those sorts of things. But otherwise, I’m coping quite well and still find that I have time to bake, even if I have to choose simpler and quicker recipes to bake! Self-saucing chocolate puddings is just one of those simple, quick recipes that you can have in front of you in less than 30 minutes (maybe even in 20 minutes if you’re quick at measuring out ingredients!). It’s been a very cold and rainy weekend in Sydney. Here we are on a Monday, everyone’s off work for the Queen’s Birthday, and it’s pouring down rain and just absolutely freezing (it’s not technically freezing, but it’s only about 55F here!). My husband took our eldest three children to nana’s for something fun to do, since there’s also no school today. I was left with a sleeping baby. The house was quiet (what a lovely sound!) and I had a fresh 1kg of Valrhona cocoa powder waiting to be used. What to do……..? This is a comparison between the very popular Cadbury Bournville cocoa powder you’d find in any grocery store here in Australia and Valrhona. Do I even need to tell you which spoon holds which cocoa? Surely not. Basically, when I look at this comparison, I can’t believe how anyone would opt for anything less than a beautiful, velvety, deep, dark cocoa powder. Okay, I suppose if you’re baking cupcakes for your child to take to school for their birthday I wouldn’t object to using an inferior cocoa. But if you want to impress or indulge, there really is no other option than the highest quality cocoa you can afford. And the proof of that is, well, in the pudding. 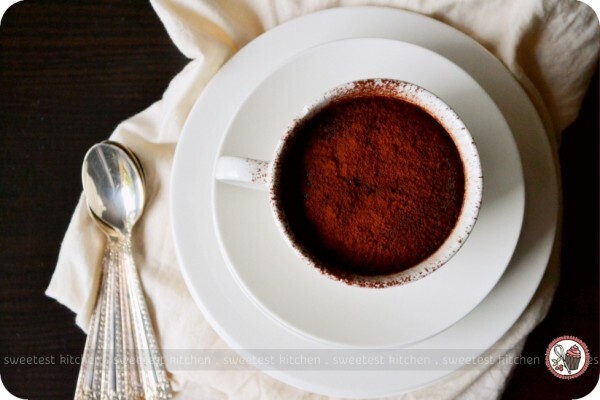 A chocolate pudding so dark in color that you can hardly tell what’s in the cup. Sprinkle it with extra cocoa powder. Grab a pretty spoon. One bite and you’ve experienced pure heavenly bliss. Look how dark that is! I just love it! I’ve made this same recipe before with other brands of cocoa. They were okay. But Valrhona took this simple recipe to the next level with a rich, deep, intense chocolate flavor. Do I recommend that you make this recipe with your average grocery-store cocoa powder? No. Absolutely not. The results will be mediocre, at best. If you’re going to make this recipe, use the best cocoa powder you can find and afford. Your efforts (and empty wallets) will be well worth it. Serve these puddings with a dollop of double cream, or ice cream, if you prefer. But as I already mentioned, it’s freezing in Sydney today and I couldn’t imagine eating ice cream! These puddings are my favorite winter warm-up. What is your favorite thing to bake in winter? These dark chocolate self-saucing puddings are super easy and perfect for chilly winter evenings. Sift the flour, almond (or hazelnut) meal, sugar, baking powder and cocoa powder into a bowl. In a separate bowl, combine the milk, butter, egg and vanilla. Add to flour mixture and mix well. Spoon into 4 x 1 cup-capacity (250ml) oven-proof dishes and place on a baking tray. 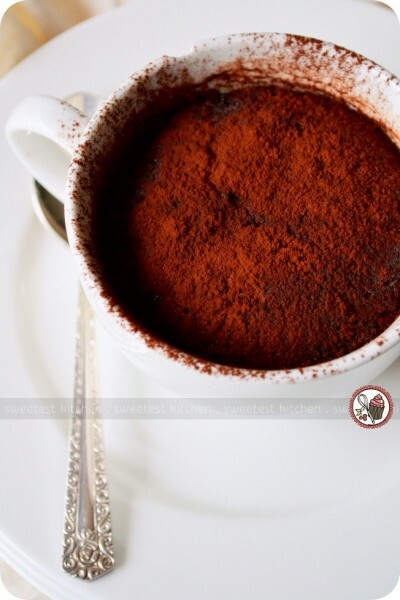 Place the extra cocoa powder and sugar in a bowl and mix to combine. Sprinkle evenly over the puddings and carefully and gently pour over ¼ cup of boiling water per pudding. Bake for 12 to 15 minutes or until the tops are just firm. oh wow that looks amazing and perfect for this weather! I really want this, yum! These look divine, Jamie! I too, am not a fan of Cadbury’s cocoa. I once bought Woolworth’s homebrand cocoa on a whim one time and I was shocked to find it’s delicious! I stick to buying that, way cheaper and so good – not to mention GF! Is that Cadbury’s cocoa used to be good – say 10 years ago? It used to be dark and rich. Now it is pale and mellow. I’m quite a fan of the Blooker cocoa that I get at my local IGA, dark, rich and quite tasty. hi, where can i find valrhona cocoa powder in sydney? Can I ask – is the 1kg packet from Paragon separated at all? I bought same from Simon Johnson and it was a box, but separated into 3 packets…. The 1kg bag I got from Paragon was not separated; it was all one big bag. Although I can’t guarantee if you order it now that it will all be in one bag, as I ordered it mid-2012 and haven’t re-ordered (yet! ).